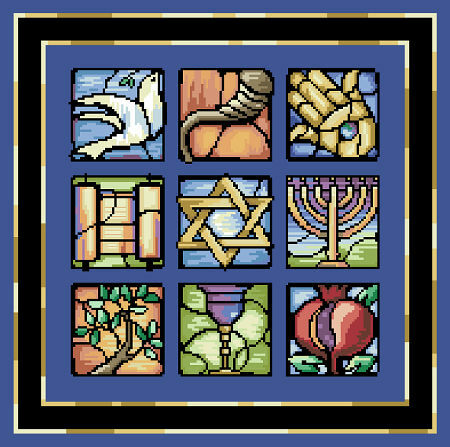 By incorporating the sacred symbols of Judaism into this beautiful Stained Glass Design it becomes the perfect gift for special occasions. The unique versatility of this design is that it is suitable for those who wish to Needlepoint or Cross-Stitch. The model was stitched with DMC floss on 18-count needlepoint canvas for use as a tallet bag, a perfect Bar or Bat Mitzvah gift for someone special. Alternate sizes and possible other uses: Pillows, matzo covers, challah covers or framed as a wall hanging to be given as anniversary or wedding gifts and handed down from generation to generation. This design is the fourth in a series of annual Judaica designs to be released at this time each year. Contents: Stitch Count 197w X 196h, Finished Size on 14 ct: 14" X 14"